Do you delight in toothpicked cheese cubes? Or prosciutto pinned to melon? The olives harpooned in your martini? If so, then may I recommend lok-lok? 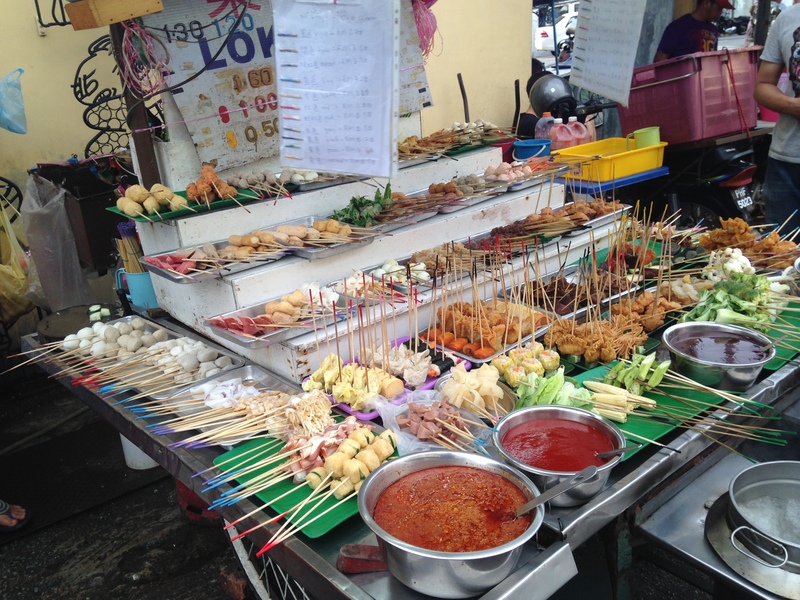 In this form of eating—it is not unique to Malaysia, but it has an ardent following—the restaurateur gets a few thousand bamboo skewers and raw ingredients. They cut the ingredients to bite size and slide them onto the skewers. 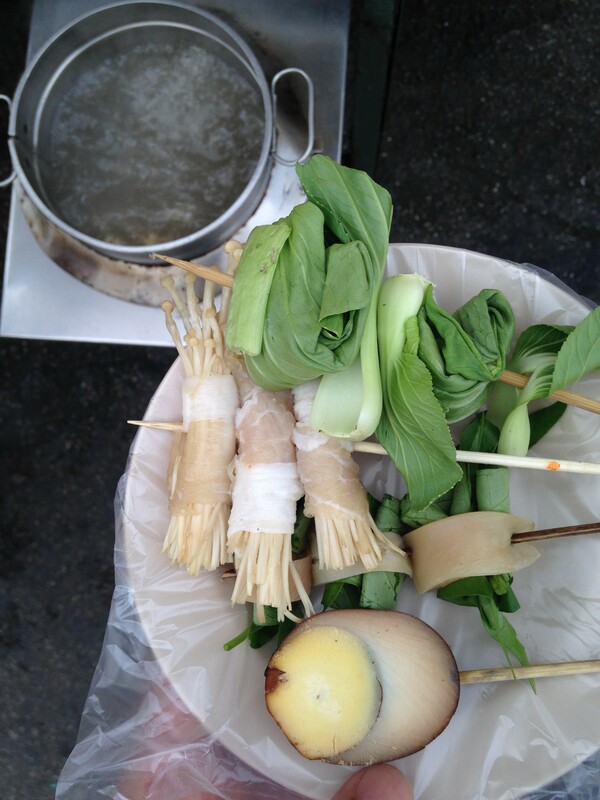 As a patron and chef, you select skewers and submerge them in boiling water or broth until they are cooked to your liking. Then rescue your skewer and enjoy! A lok-lok cart in the Heritage District of George Town on Penang. The gripping end of the skewers are color coded, and the pricing for each color is decoded using the page protectors hanging from the umbrella. Three sauces are available at the front of the cart, and one of the cooking pots is shown at the lower right edge of the frame. Click the photo to enlarge. 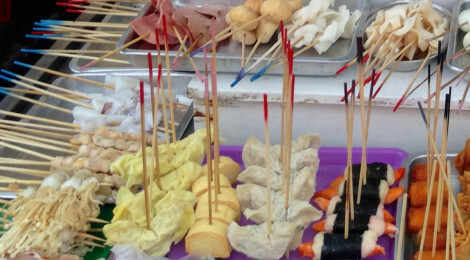 Lok-lok establishments vary from street carts that look like a porcupine to elaborate, high-end buffets. There is art at every level, from selecting ingredients, to the flavor combinations created by mixing ingredients on a single skewer. And that’s just the beginning: How does a particular skewer please the eye? How many different broths are offered? How are the broths flavored? What heat is used to sustain the boil (Yes, some will say an electric burner is no substitute for glowing charcoal.)? Like a flight of wine, should particular types of skewers by eaten in a particular order? What sauces are on offer? Will you choose a peppery sauce, or one with a tamarind flavor? Lok-lok skewers about to meet the cooking pot. As you might guess, the hard-boiled egg with the patina of tea needs only to be warmed, while the streaky pork surrounding the mushrooms needs a higher temperature. It’s the joy of cooking! Click the photo to enlarge. With so much choice, delights of taste are easy. A more subtle part of the fun is learning how to cook skewers this way. Some of the boiling pots are deep and you can fully submerge your skewers. Others are wide, flat pans where you rotate the skewer once or twice as it cooks and rising steam plays a larger role in the cooking process. Does this spear of food take two minutes? That one four? Do you like your bok choi crispy or wilted? You might be familiar with satay, where chicken, fish, pork, or beef are marinated, skewered on bamboo, and deliciously grilled over open flame. Our Malaysian friends would be disappointed if we confused satay and lok-lok. Satay: grilled. Lok-lok: boiled. Our first lok-lok experience—a cart just off Lebuh Campbell in George Town—got us thinking about the roles of menu planner, cook, and diner, and the fun in blurring those roles. Whether fondue, shabu-shabu, or a Chinese steamboat meal, the eater-is-also-chef model offers a thrill in experimentation and control that’s worth seeking out.